This is a photograph taken of a Humane Education display in Tennessee c.1935. Six women pose at the booth which has a placard with the words “HUMANE EDUCATION” right in the centre. As this photograph shows, it was often women who took a primary role in advocating for Humane Education at this time. Bouquets and floral arrangements have been added to this display for visual effect. 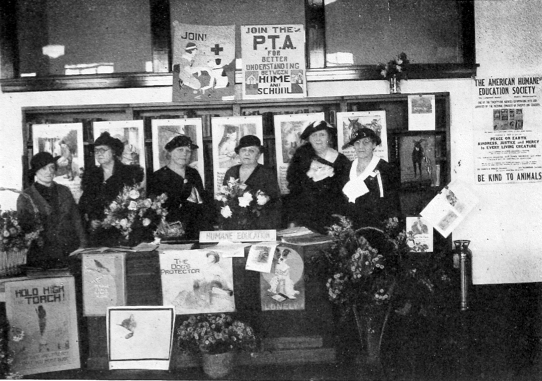 At the back of the booth are 6 posters, a series the AHES began selling in conjunction with the New York-based National Child Welfare Association in 1921.